Mobile numbers are always numeric and of a certain length. You want to ensure data entered is exactly as per that. 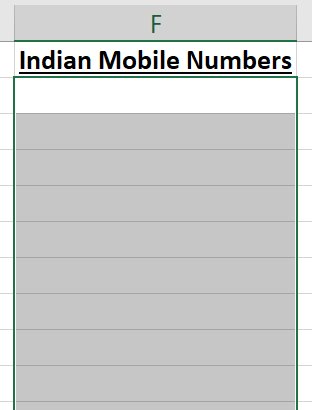 In India, mobile numbers are 10 digits. Meaning if any mobile number that’s entered isn’t exactly 10 digits, it’s not a correct data entry. Similarly, in other countries, mobile number length’s vary. Whether you’re in India, USA, UK Australia, wherever, this method will be extremely useful for you. 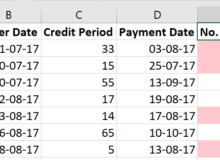 The F2 is simply because we are using the F column for the mobile numbers column, 2 is the row from where the data entry starts. 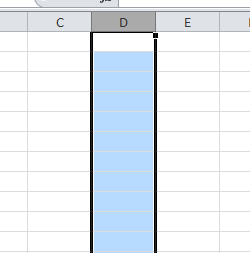 $F is, we are asking Excel to check only the F column for the 2 conditions. this checks whether the data entered is numeric or not. Internally, it gives a boolean value as TRUE or FALSE. So if the data entered in numeric, it will be internally TRUE, else FALSE. 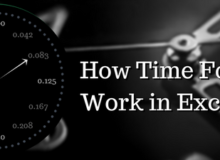 this checks whether the data entered in 10 digits or not. Internally, this too gives a boolean value as TRUE or FALSE. So if the data entered in 10 digits, it will be internally TRUE, else FALSE. ANDing means, both conditions should be TRUE. 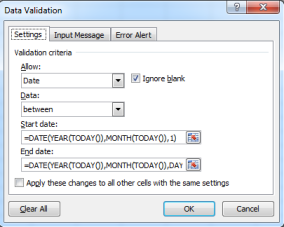 So only when both the boolean results are TRUE, the data validation will allow the data entered by the user. 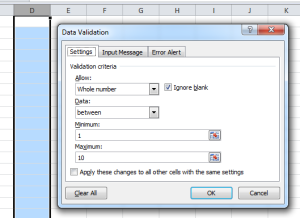 If any one value is FALSE, the data validation will reject the data entered by the user. 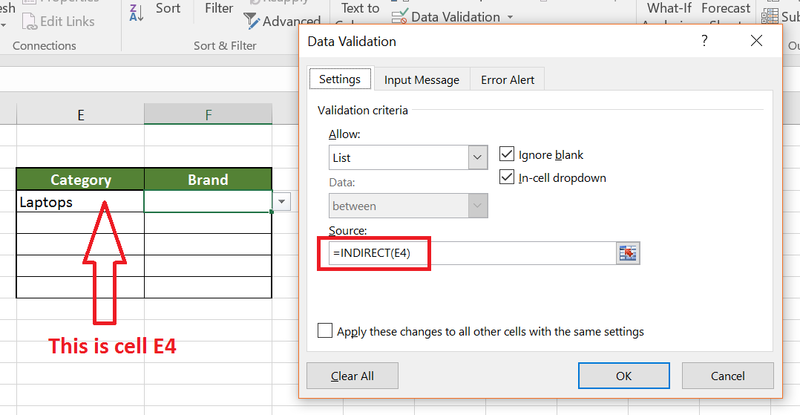 Creating a drop-down list in Excel is very easy, using Data Validation. 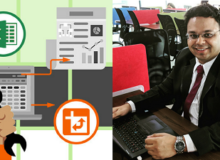 Click here to see how to create it. Then come back here. Now we will see how to create a dependent list – a list based on a selection in another list. Thus you will be able to items items based on your selection in another list. 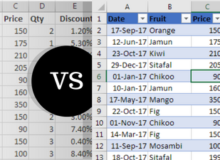 Once you select 1 of the categories from the drop-down, in another cell, you should be able to select a Brand which is under only that particular category. Named Ranges will need to be used to create such a list. 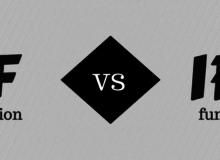 Click below 2 links to understand Named Ranges basics. Then come back here. Ensure that none of your named ranges have any spaces in between 2 words. In Source, type =Categories (this is the named range we gave earlier). You will see that you are able to select the Categories in each of the cells, from the drop-down. A dependent drop-down list is created, based on your selection of the Category. 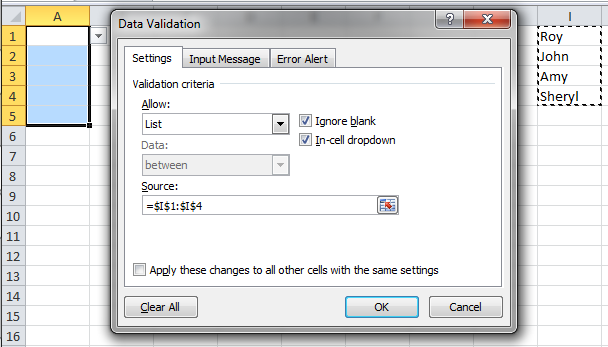 =INDIRECT(E4) goes into cell E4 and checks what is the content of that cell. If the content is ‘Laptops’, it will go and fetch the entries in the Named Range ‘Laptops’. If the content is ‘MobilePhones’, it will go and fetch the entries in the Named Range ‘MobilePhones’. E4 when does below 1 row, becomes E5. 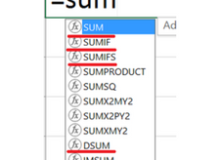 Thus Whatever is selected in E5’s drop-down, the dependent list appears in F5. 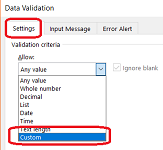 And so on..
We will cover 3 ways within data validation that can be used to display a list of names, or a list of anything. 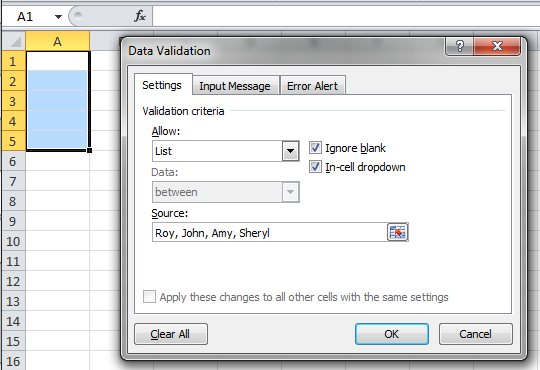 To change any of the names, you will have to go back to Data Validation and change it manually in the source box. But this can be avoided with the next 2 methods. To change any of the names, simply change the name in J1 to J4 and will get automatically updated in the drop-down list. Let’s say there are too many drop-downs that you need to create in your file, and rather than remembering which values are kept in which cells (J1 to J4), you want to simply use names. 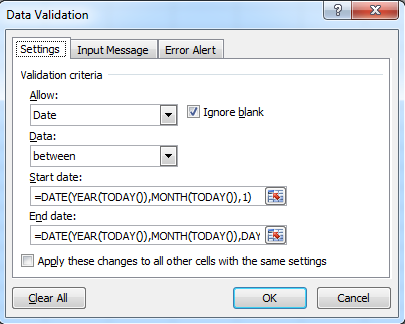 Let’s say you create a data validation on a cell, allowing only whole numbers from 1 to 10. 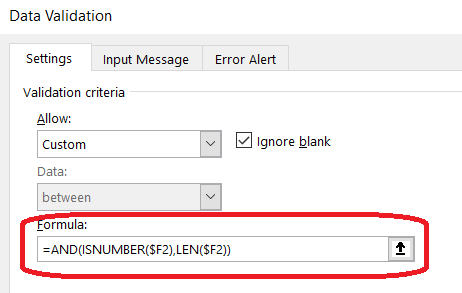 When any user enters either a decimal number, or any other number apart from 1 to 10, Excel throws an error like this. 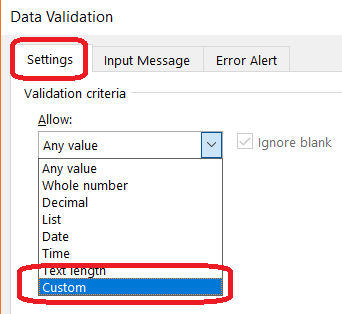 Now you want to customize the Title (Microsoft Excel) and the Text written in the Error message. and the Error message to be “Invalid entry. Enter only whole numbers between 1 to 10”. 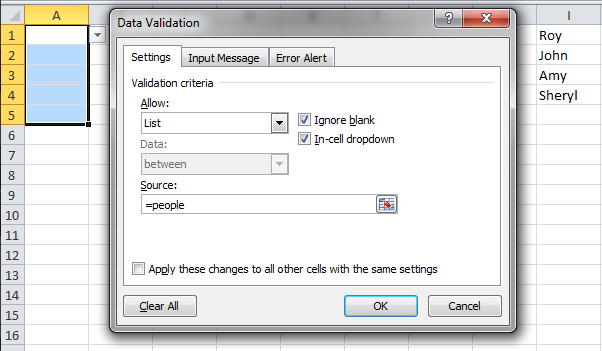 Go to Data Tab, and click on Data Validation. 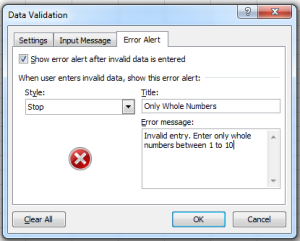 Then click on Error Alert, and type and Title and Error Message. When the user enters an invalid entry, this will come up.